Carmarthenshire Moth and Butterfly Group: Miscellaneous Moths: a quick and incomplete summary. Miscellaneous Moths: a quick and incomplete summary. I`ve done a few traps during the last week, mostly at home where, among the usual mix were a couple of lime hawk-moths and the tiny Cochylis nana was caught twice. The first time it was with a mix of small dead micros at the base of the MV trap container, presumably killed by contact with the hot bulb. This first individual confused me as, for some reason, I had `pre-decided` that it was not a cochylid or tortricid, but fortunately assistance was sought and it was identified; two days later a live individual was also in one of my traps and, this time, i/d was n`t a problem. It is a birch feeder and was probably brought on a southerly wind the few metres from Pwll Lagoon SSSI where birch abounds. 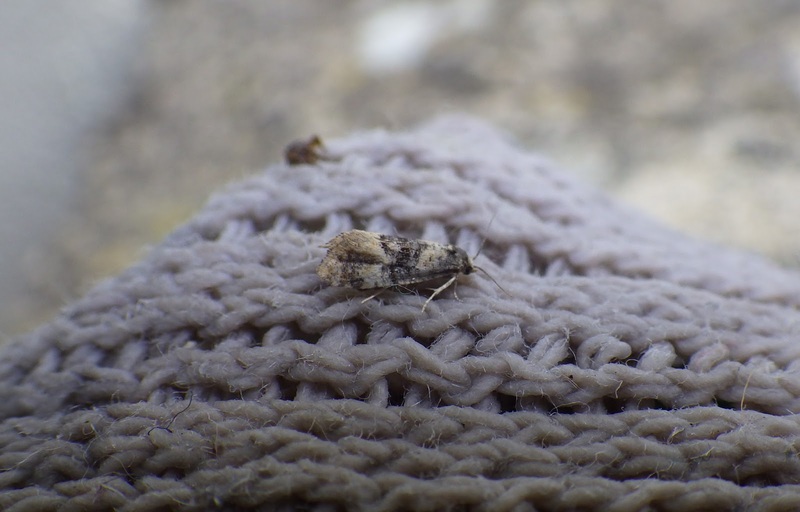 Above: Cochylis nana, which escaped, but luckily landed outside on an old floor cloth! `Dusking` has been productive of late, particularly of micros and I recommended it thoroughly. 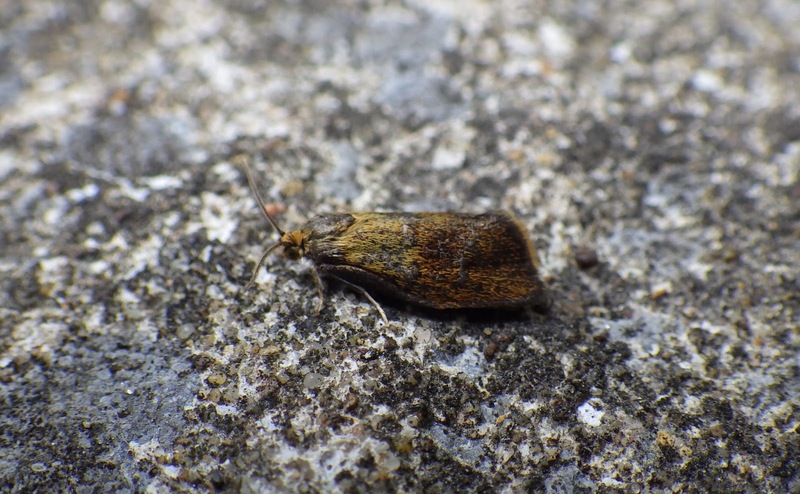 A very quick session at the Llangennech saltmarshes on Wednesday evening yielded some 50+ individuals of Gynnidomorpha vectisana in a saline ditch dominated by Triglochin maritima, its food-plant, adding to the records made at North Dock, Llanelli last year. Chris Manley - who I met straight away afterwards (hence the rush at Llangennech) - has since taken a typically first-class photo of an individual of the latter that I gave him. Chris and I trapped that night at Troserch Woods, a deep, oak/bilberry cwm with spruce plantations, located just north of Llangennech. A modest catch was obtained, but we were too early for bilberry pug and either too early or too late for certain other conifer specialists (though a few records of `conifer associates` were made). After leaving Chris at about midnight (when we packed up), I visited another trap that I`d left out in some wet Salix alba (and other trees) woodland at Dafen, as it was on the way home. The best moths here were two small clouded brindles and Ptycholoma lecheana. I also had two home traps set up but they were left until the morning (after about an inadequate four hours sleep) but they essentially held `repeats` of earlier catches, except for a few new (common) species. 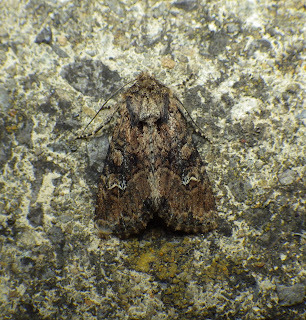 Above: small clouded brindle, one of two caught at Dafen. Above: Ptycholoma lecheana, a slightly worn individual, but still with its metallic tropical hues. More dusking on Thursday evening yielded a few migrants: diamond-backs (also seen at a few other sites), two rusty dot pearls and a silver y, all seen just east of Burry Port in coastal habitat. A descent into a saltmarsh drainage channel SW of Pwll, on the same evening, proved worthwhile with more G. vectisana seen. Another dusking session ( c 8.00 to 9.30 pm) was undertaken on Friday evening, around Pwll Fishing Lakes and a tiny (but floristically-diverse) adjacent brownfield site. Probably the best moth seen was Elachista maculicerusella, swept from an area with Phalaris and Phragmites, its food-plants. Also, Glyphipterix forsterella seen around Carex hirta. The silver dot in the `eye` of the wing distinguishes this species. If you get a chance, Ian, take a sneaky look at Chris Manley's photographic equipment. He's obviously got something very special in the camera line to take such brilliant photographs - or is it all down to technique?